Ben Roberts has left Castleford Tigers after coming to a mutual agreement with the club to be released from his contact. The decision has come following conversations between Roberts and the club, which have resulted in both parties bringing an end to his four seasons at the Mend-A-Hose Jungle. In that time Roberts has played 78 times for the Tigers after joining for the start of the 2015 campaign. He enjoyed a number of good times at the Jungle, winning the 2017 League Leaders’ Shield, with one moment that will stick in the memory of Tigers fans being his match winning drop goal against this week’s opponents St Helens in his first year at the club. The Samoan and New Zealand international previously enjoyed a successful career in the NRL prior to heading over to England playing in over 130 games for Melbourne Storm, Parramatta Eels and Canterbury Bulldogs. 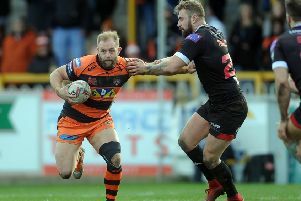 Tigers director of rugby Jon Wells said: “I think the first thing to say is that Ben should be incredibly proud of the contribution he has made to the Castleford Tigers since his arrival in 2015. He played his part in re-positioning this club to where we are today. At his best, he was unplayable. “In recent months, Ben’s injury issues have meant he has struggled to reach a point of fitness and availability that would allow him a continued run in the matchday 17 and, following a series of long but amicable discussions, we have reached an agreement which works for both Ben and the club. Head coach Daryl Powell said: “I think it’s fair to say it’s been frustrating for both Benny and ourselves that he hasn’t been able to get on the field as often as he’d like and unfortunately that looked increasingly unlikely. We therefore felt it was best to come to an agreement between ourselves so that we could all move forward. “Benny has had some fantastic times at the club, particularly in 2017 when he played probably the best rugby league of his career. He really was pivotal to us being outstanding that season. In and amongst that, he’s found it really difficult physically to get onto the field and given his standing within the squad it’s also become difficult for us from that perspective.